One of the issues I’ve struggled with over my years of homeschooling is the desire to do hands-on science projects with my children and the time/effort/inconvenience needed to gather all of the materials to do so. While I adore doing hands-on projects with my children, I do not enjoy gathering up all of the needed materials, running out at the last minute to purchase that one thing I thought I had but I actually don’t, and realizing that I can’t do the desired project because I just can’t find or purchase a required object. Therefore, all in one hands-on kits have always greatly appealed to me! Given my love of the convenience of hands-on, educational kits, I was thrilled when I was contacted by a representative from The Young Scientists Club to review one of their new kits. I chose Science on a Tracking Expedition from their Nature Series. Science on a Tracking Expedition is geared for children ages 4 and up. I am using it with my 9 and 12 year old sons, and I also plan to include my 14 year old daughter in some of the activities as well. Most of the materials in the kit can be used multiple times, making it quite practical for more than one child to use at once. As well, the materials that may need to be replaced with multiple users (dirt, plaster of paris, paints, and plastic bowls) are quite easy to gather or purchase. 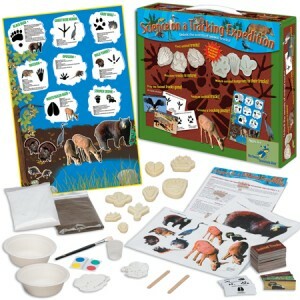 While there is definitely enough educational material included to spend at least a week of science lessons exploring the activities, this kit could easily be the beginning of a unit study about animal tracks. Additional books, videos, or field trips could be added to learn more about the featured animal tracks. If you would like to learn more about Science on a Tracking Expedition or other educational science kits, you can visit The Young Scientists Club website to learn more about the wide variety of products they offer. Science on a Tracking Expedition is available for purchase at The Young Scientists Club website for $29.99. Samantha has homeschooled her three children since her oldest child was in first grade. She uses a wide variety of curriculum in her homeschool to best meet the needs of her children. Samantha writes about homeschooling and family life at To Be Busy At Home. Samantha received the Science on a Tracking Expedition kit free in exchange for her review of the product. No other compensation, monetary or otherwise was given for her review. I am all about the all inclusive stuff. I have failed to complete some really cool curriculums I have purchased because it is just too hard to find the needed items, I am too broke to buy them or they are too hard to make! Thanks for sharing. I will be following you and have listed you on my blog roll! .-= SnoopyGirl´s last blog ..Muffin Tin Monday Christmas theme! =-. This looks like a lot of fun! If you have a dichotomous that would be a great way to expand this kit for older students. I have one that we have used called Animal Tracker by Dorcas Miller. It not only has the animal, its tracks, its gait and also its range. Thanks for sharing! I checked out the link! I had no idea they had new kits out! I think I might order some for the kids:) We’ve done these type of track molds at our Nature center and the kids love it.